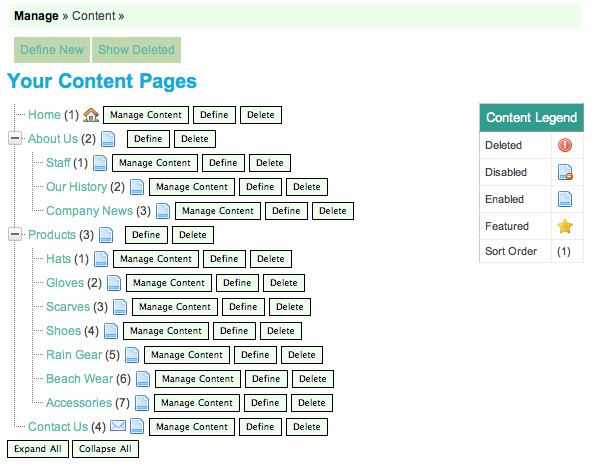 On your 'Content' management screen, you will notice that every page has a 'Delete' button to the right of it. Deleting the page is as simple as clicking this button. Be aware though that if you delete a page, and it has pages nested underneath it, those pages will then default to the Parent level of the page you've deleted. If you decide to delete a whole section of nested pages, you will need to delete each individual page BEFORE you delete the Parent page they were nested under. For instance, if I choose to delete the entire About Us nest of pages below, I should first delete Staff, Our History, and Company News, before I delete About Us. If I delete About Us first, then Staff, Our History, and Company News will become un-nested under About Us, and will reside at the top level of the navigation, just like About Us had.